These steps have been a back-cracker from day one. 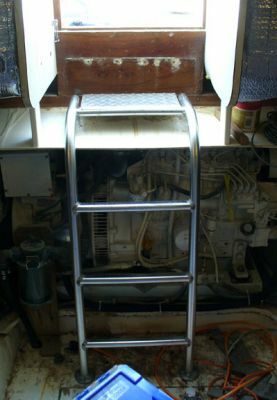 We moved the generator strainge to starboard about 5" which allowed us to cut 6" off and move the steps that much closer to the cockpit. The problem had been that you could not get out of the engine room without literally having to crawl onto the cockpit floor. By moving the steps 6", your back does not hit the Salon floor and you can almost come out of the room vertical. It is hard to believe this had not been changed previously.